The Peoria Tribe of Indians of Oklahoma is a confederation of Kaskaskia, Peoria, Piankeshaw and Wea Indians united into a single tribe in 1854. The tribes which constitute The Confederated Peorias, as they then were called, originated in the lands bordering the Great Lakes and drained by the mighty Mississippi. They are Illinois or Illini Indians, descendants of those who created the great mound civilizations in the central United States two thousand to three thousand years ago. Forced from their ancestral lands in Illinois, Michigan, Ohio and Missouri, the Peorias were relocated first in Missouri, then in Kansas and, finally, in northeastern Oklahoma. There, in Miami, Ottawa County, Oklahoma is their tribal headquarters. The Peoria Tribe of Indians of Oklahoma is a federally-recognized sovereign Indian tribe, functioning under the constitution and by-laws approved by the Secretary of the U.S. Department of the Interior on August 13, 1997. Under Article VIII, Section 1 of the Peoria Constitution, the Peoria Tribal Business Committee is empowered to research and pursue economic and business development opportunities for the Tribe. The increased pressure from white settlers in the 1840’s and 1850’s in Kansas brought cooperation among the Peoria, Kaskaskia, Piankashaw and Wea Tribes to protect these holdings. By the Treaty of May 30, 1854, 10 Stat. 1082, the United States recognized the cooperation and consented to their formal union as the Confederated Peoria. In addition to this recognition, the treaty also provided for the disposition of the lands of the constituent tribes set aside by the treaties of the 1830’s; ten sections were to be held in common by the new Confederation, each tribal member received an allotment of 160 acres; the remaining or “surplus” land was to be sold to settlers and the proceeds to be used by the tribes. The Civil War caused considerable turmoil among all the people of Kansas, especially the Indians. After the war, most members of the Confederation agreed to remove to the Indian Territory under the provisions of the so-called Omnibus Treaty of February 23, 1867, 15 Stat. 513. Some of the members elected at this time to remain in Kansas, separate from the Confederated Tribes, and become citizens of the United States. The lands of the Confederation members in the Indian Territory were subject to the provisions of the General Allotment Act of 1887. The allotment of all the tribal land was made by 1893, and by 1915, the tribe had no tribal lands or any lands in restricted status. Under the provisions of the Oklahoma Indian Welfare Act of 1936, 49 Stat. 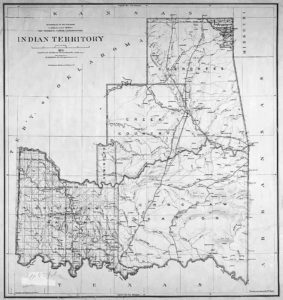 1967, the tribes adopted a constitution and by-laws, which was ratified on October 10, 1939, and they became known as the Peoria Tribe of Indians of Oklahoma. As a result of the “Termination Policy” of the Federal Government in the 1950’s, the Federal Trust relationship over the affairs of the Peoria Tribe of Indians of Oklahoma and its members, except for claims then pending before the Indian Claims Commission and Court of claims, was ended on August 2, 1959, pursuant to the provisions of the Act of August 2, 1956, 709 Stat. 937, and Federal services were no longer provided to the individual members of the tribe. More recently, however, the Peoria Tribe of Indians of Oklahoma was reinstated as a federally recognized tribe by the Act of May 15, 1978, 92 Stat. 246. The Kaskaskia, along with the Peoria, were two of the principal tribes in what was known as the Illinois Confederacy. At the time of first European contact, the tribes of this confederacy held sway over the present area of southern Wisconsin, northern Illinois and along the west bank of the Mississippi River as far south as the Des Moines River in Iowa. By 1700, however, most of the tribes of the confederacy resided in northern Illinois, chiefly on the Illinois River. As a result of continuous war with their northern neighbors, in particular the Sac and Fox Tribes, by the time of the Revolutionary War the Confederacy, represented now by the Peoria and Kaskaskia, was reduced to a fraction of its former strength and had been dispossessed of most of its former territories. The tribes managed to avoid major conflict with the Americans in both the Revolutionary War and the trouble, which culminated in the Battle of Fallen Timbers and the 1794 Treaty of Greenville. By the Treaty of August 13, 1803, 7 Stat. 78, the Kaskaskia ceded all of their remaining lands in Illinois to the United States in return for protection and patronage. During the trouble associated with the War of 1812, most of the Kaskaskia removed west of the Mississippi to Missouri and Arkansas where they maintained their close relationship with the Peoria. On October 27, 1832, the two tribes signed a treaty, 7 Stat. 403, which gave formal recognition to this union and granted them 150 sections on the Osage Reserve in Kansas. The Wea Tribe was a subtribe of the Miami Nation. In the late seventeenth century they lived near the western shore of Lake Michigan. During the next 150 years, they moved frequently and the 1750’s found them living on the Wabash and White Rivers, in the present States of Indiana and Illinois. The Weas supported the British during the Revolutionary War. 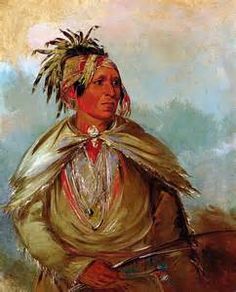 The tribe was also involved in the unrest of the 1790’s in the northwest, which culminated with the Indians’ defeat at the Battle of Fallen Timbers in 1794. Two Wea Chiefs signed the subsequent Treaty at Greenville. Some of the Weas joined the confederation headed by two Shawnee brothers, Tecumseh and the Prophet, in the first and second decades of the nineteenth century. Other members of the tribe, in an attempt to disassociate themselves from this movement, removed west of the Mississippi to an area south of St. Louis. Here they maintained their close relationship with bands of the Piankashaws and Peoria, some of whom had earlier removed to this area. On October 2, 1818, at St. Mary’s, Ohio, the Weas ceded most of their lands in Indiana, Illinois and Ohio, except for a reserve in Indiana, on the Wabash River. The remaining Indiana Reserve was ceded by the Treaty of August 16, 1820, 7 State. 209. Having disposed of all their lands, the remaining Wea removed to Missouri and Arkansas where they joined the other tribal members and the Piankashaws who had also left Indiana and Illinois. By the Treaty of October 29, 1832, 7 Stat. 410, the Wea, jointly with the Piankashaws, were granted 250 sections of land in what is now Miami County, Kansas, on lands adjacent to the Peoria and Kaskaskia Reserve. The general outline of the emblem is an arrowhead bearing four crossed arrows. Each of the arrows represents one of the four tribes making up the tribe now known as Peoria. The red background symbolizes the tribe’s past – the trickery, the tears, the hardships, and the heartaches that our ancestors endured. The large arrowhead of natural color represents our present generation – a promise that we will work, as individuals, and as a tribe, to cherish and preserve our heritage and customs. The arrowhead points downward, indicating peace. We will live in peace, but we will not be suppressed. The turquoise arrow of the Piankashaws represents our native soil. The red arrow of the Peorias represents the sun. The blue arrow of the Weas represents the blue waters. The green arrow of the Kaskaskias represents the green of the grass and the trees. May our tribe never forget that these are gifts from the Great Spirit. The crossing of the arrows represents our promise to future generations that by banding together our spirit cannot be broken and our heritage and customs will never be forgotten. Alice Giles Burgess, a tribal member, designed this emblem. It was presented to the Peoria Tribal Business Committee and approved by them on January 29, 1983. It was presented to the tribal membership at the Annual Meeting in March 1983. Upon the death of a tribal member, the family will need to call the Peoria Tribal Office. 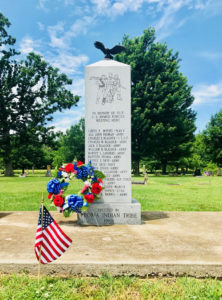 If other family members are already interred in the cemetery, every effort will be made to locate an available grave site nearby. Once the grave site has been determined, tribal office staff will make contact for digging of the grave. The family of the deceased is responsible for the costs of digging the grave. There is no other cost to individuals of Peoria descendant for plots in the tribal cemetery. For a map to the Peoria Cemetery please contact Mandie at the office at 918-540-2535. 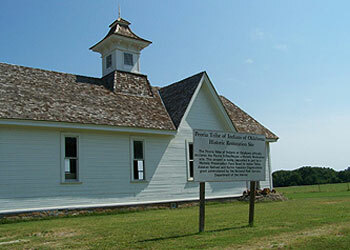 The schoolhouse is in its final phase of restoration. National Park Service funds will be used for installing floor registers and filter grille to complete the HVAC system, installing wood flooring, installing light fixtures, switches, outlets, and panels to complete the electrical system, replacing crawl space access doors with metal bars, completing the stone walkway at the western entrance, replacing metal louvers on the cupola with painted wood louvers, and replacing an inappropriate concrete stoop at the southeastern entrance with a porch. It has also gotten a much-needed coat of paint on the exterior, and has had storm windows installed to help make it more energy efficient.